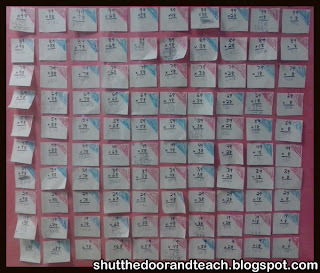 Although I usually only post on Wednesdays, I wanted to continue sharing the results of yesterday's post about our 100s day math game. 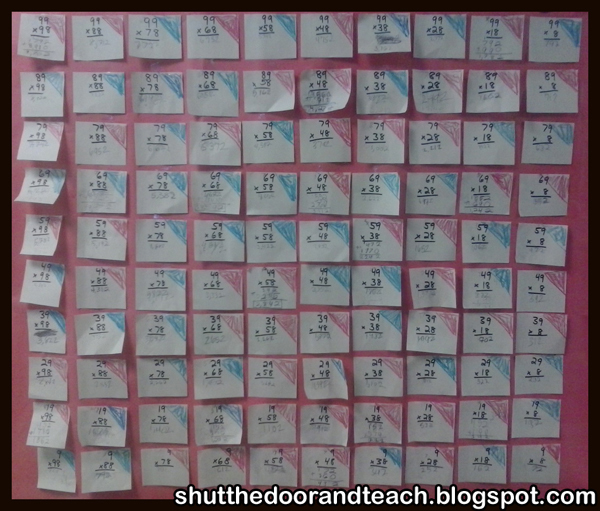 Overall, the two digit by two digit multiplication game I created for my fourth graders was a big hit! I had a couple kids thank me for two reasons: they thanked me because it was fun, and they thanked me because they could tell it was helping them hone their computation skills. One girl told me, "I have had to do 8x9 so many times that I've got it now; I'm definitely not going to forget it!" 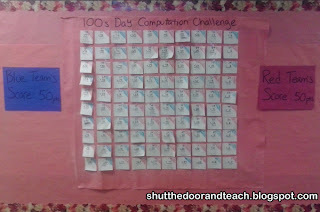 There were a few problems with this 100s day math activity. I had one girl who put way too much pressure on herself, so in the final 10 minutes of the game when she got one wrong she went over to a corner in the room and broke down in tears. This is why I don't do competition very often. But I simply said to her firmly, but in a caring voice, "Don't you dare cry. You scored WAY too many points for your team today to cry. You hold your head up high and be proud of yourself for that. Understand?" She smiled and wiped her tears away. And one of the boys who had called her a good teacher earlier, because he was one of the kids who couldn't solve the problems independently until she helped him today, spent a couple minutes consoling her until she got up to start another problem. Another problem was a boy on the other team who decided to try to win the game single-handedly for his team. He tried to take on as many problems as he could instead of helping his teammates to do the problems. He also did something in the end that felt a little bit ruthless. The game was down to a tie. Two girls were working together on a problem and double and triple checking it, afraid that they would get it wrong as their whole team watched on bated breath. He solved his last problem and held onto it. When asked why he didn't bring it over, he said, "Because their problem is easier. I already know the answer to it. If they get it wrong, they have to give it to me, and I'll hand that one in and win the game." I wasn't sure if I should allow that or not. Was it a good strategy, or ruthless? I decided to say nothing and see what his peers thought. If it upset the other kids, I'd have put a stop to it. But they seemed to take it in stride, so I allowed it. I'm still not sure if I sent the right message by doing that, but I can always watch for other opportunities to help him learn about fair play. Just as I did a few minutes later. It was a tie game! "Why do you think we did this activity?" We could have done lots of activities for 100s day. "It let us practice 2x2 digit multiplication." "You let us pick the regular way or the lattice way." "It got us ready for the math MCAS. "Yes, but what do you think was my non-math reason?" "It made us work as a team." "Yes," I answered. "I wanted you to work as a team; that's why I made sure you knew who on your team needed your help, and let you know you needed to help them. So for the tie-breaker, I want to see which did more to help out their members who needed it. You will all have to solve one problem, by yourself. 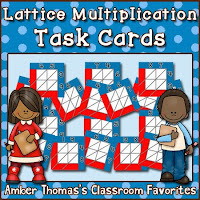 Each correct answer gets 1 point, so those kids who were taught how to solve two digit multiplication problems by their teammates will push their team to victory." And in the end, the difference between the winning and losing team was just one point.